● Size: LWH 20*15*10 mm/ 0.79"*0.59"*0.39"
● In the 64 subdivision or 128 subdivision to have a better ultra-quiet effect. 1. Driver current algorithm: i=Vref/0.5, the default Vref about 0.4V, so the default current 0.8A, and maximum current 1.5A. 2. Please DO NOT connect the motors when measuring the voltage, or it's easy to burn the drive. 3. Please connect both the power supply and the USB for power when measuring the voltage. 4. Minor adjustment for potentiometer driver. Adjust it again after measurement to avoid burning driver by excessive current. 5. To increase the current by rotating the potentiometer clockwise slowly, and anticlockwise to reduce. LV8729 driver board widely used in 3D Printers MKS RAMRAP and other board. Support subdivisions: 1, 1/2, 1/4, 1/8, 1/16, 1/32, 1/64, 1/128. In the 64 subdivision or 128 subdivision to have a better ultra-quiet effect. Please kindly Note: Please make sure the connecting direction is right, or it will probably burn the driver chip and controller board. 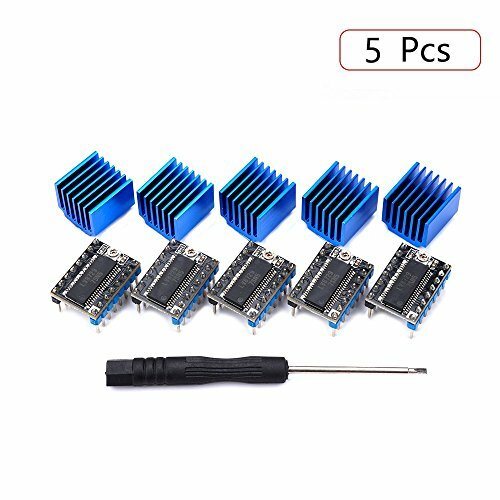 Recommend to do a good job of cooling for the module. Technical Support: each one defective item can have the free replace or refund, we will send the LV8729 Tester file and User Manual file(.md) to your email when you have ordered, please pay attention to receive them. If need more help please fell free to email or QA us, our engineers are here for waiting you all the time.